While dealing with the forms, information can be submitted and transferred to same or another page. 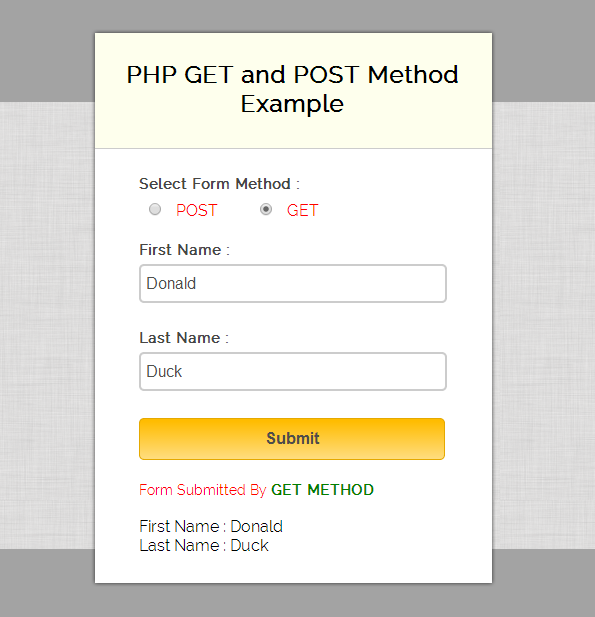 To send submitted data through form, one can use GET & POST method to do that in PHP. A form data can be submitted using these two methods. Both are used for same purpose but stands apart under some specifications. As in GET method key values are passed in the Url while in POST, the information transfers in a hidden manner. A form submitted information is appended in to the url in the form of Query String consisting of name=value pairs in URL. This string contains user values/data, which are separated by ampersand and spaces are replaced with + sign. We have covered lot of examples in which, we set method attribute of form to GET or POST. Let’s discuss about them in detail. As explained above, before sending any information , it converts values/data into a query string in URL known as Url Encoding. Which contains both page link and encoded information separated by the ? character. Client Side: Below code is an HTML form with method=”get” for user to fill information. Server Side: Below code has PHP script where, $_GET associative array is used to receive sent information at server end. Above query string of information, generated by Get method can be readable in address bar therefore, never use Get method for sending sensitive information to server. One should avoid use of this method to send binary data like, Images or Word Document file to the server. As explained above, before sending information to server, it converts client’s information into a query string in URL. Client Side: Below code is an HTML form with method=”post” for user to fill information. Server Side: Below code has PHP script where, $_POST associative array is used to receive sent information at server end. Query string , generated by Post method never appears in address bar i.e. it is hidden for the user therefore, we can use this method for sending sensitive information to server. Moreover, we can make use of this method to send binary data to the server without any restrictions to data size. In our example, we allow user to choose a method via radio button and this value is assigned to form’s method attribute. Watch our live demo or just follow our codes and download it. Complete HTML and PHP codes are given below. Given below our complete HTML form. Below PHP code display values on the basis of GET and POST method. In the below script, we used on change event to get value of radio button. As this value is assigned to method attribute of form. For above reasons, POST method is widely used to send the information to server. Hope this tutorial helped you a lot, keep reading our other posts for more coding tricks. Keep reading our blog posts for getting more coding tricks. great get and post information . Can you help wonder how I use adding table into a form ? This tutorial quite help for to me thanks. i was hosted a website ,, but its not working properly..will u help me for this. upto cart page i was success.after cart page i need ..
to try to spray foor pests or call out an exterminator every few months. like to eat certain ingrwdients and this number is on the increase. Microscopic ear mites ljve inside the ears of rabbits, ferrets, cats and sometimes dogs. in your model (or any accessible class).